Remodeling debris disposal. It’s something that too many homeowners don’t give much forethought about. That is, until it’s piling up and can’t be ignored. Then, you’ve got to deal with it and that puts you in a bind. This invites unneeded stress and also throws a monkey wrench into the whole process. It could well cause the timeline to actually be put back even further. And, you definitely don’t want to extend the inconveniences any longer than necessary. 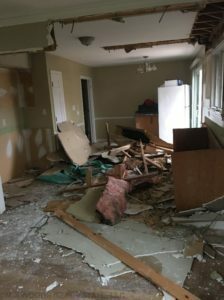 The thing about remodeling debris disposal is it’s generally something which doesn’t fit into the overall plans. Yes, it’s true. There is a sizeable amount of households which undertake a remodel without ever considering the massive amount of debris it will generate. Make no mistake, it’s part of the whole process. So, you need to plan for it well in advance. Otherwise, you’ll have a huge mess on your hands. Plus, it’s not just messy and inconvenient, it’s also a safety hazard. The longer it stays, the bigger the risk it will result in an unfortunate circumstance. And, it’s got to go but you need an effective way to deal with it. Create a plan in advance. Any experienced contractor will tell you planning is key to success. Unfortunately, too many people go with a little more than an idea and a few estimates about time and cost. To make it a more rewarding journey, you really need to create a solid, actionable plan. Repurpose what you can salvage. One way to cut down on costs is to save what you can, when you can. As you collect more and more of it, you can repurpose it for other uses. Donate unused construction materials. Keep in mind, there’s a chance you might not use all the materials. Although this doesn’t happen often, it does happen now and again. If this is the case, consider donating unused materials. Bring in remodeling debris removal crew. The best way to deal with remodeling debris is to have a junk removal service come and pick it up. If you need remodeling debris disposal, go ahead and phone 800-433-1094 or visit Junk Garbage Removal.